Any Ideas for Dinner? : "ah-YEE, that good 'n spicy, I guarantee!" "ah-YEE, that good 'n spicy, I guarantee!" Okay, time for a quick recipe for a wonderful addition to your spice rack... Louisiana Seasoning. The original recipe I used was Chef Emeril Lagasse's Essence seasoning. I came across the recipe while reading through Julia Child's "Cooking With Master Chefs", a gift from Regina one Christmas. I mixed up the first batch, and soon after we started using, we found it rather salty. 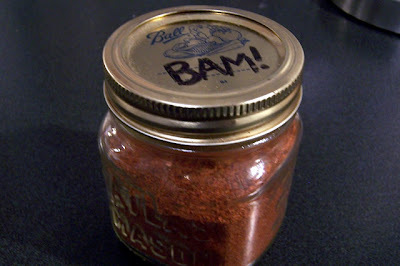 I cut back on the salt, and beefed up the paprika, and we've been pretty happy with it since. We use it a wide variety of dishes, and especially in our East Buffalo Chicken (coming soon... really!). "ah-YEE." That's Cajun for "Youbetcha." 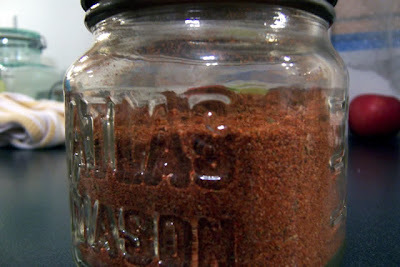 I keep my rib rub in a mason jar like that. I've drilled out the lid to make a shaker. To keep it airtight, I put a few layers of plastic wrap over the mouth before I put the lid on. You could also double-lid it... perf one lid for shaking, and then use a non-perfed lid for sealing it tight. "I Want To Drink Your Blood"
On the Shelf - "The Joy of Cooking"
trains, planes, automobiles... and sausage?! ?